My husband told me he sees all that I do. He mentioned that I help my stepdaughter with her homework, I grocery shop, and I do the laundry. He acknowledged the gift buying, the schedule keeping, and the dish washing. But he missed the stepmom piece entirely. 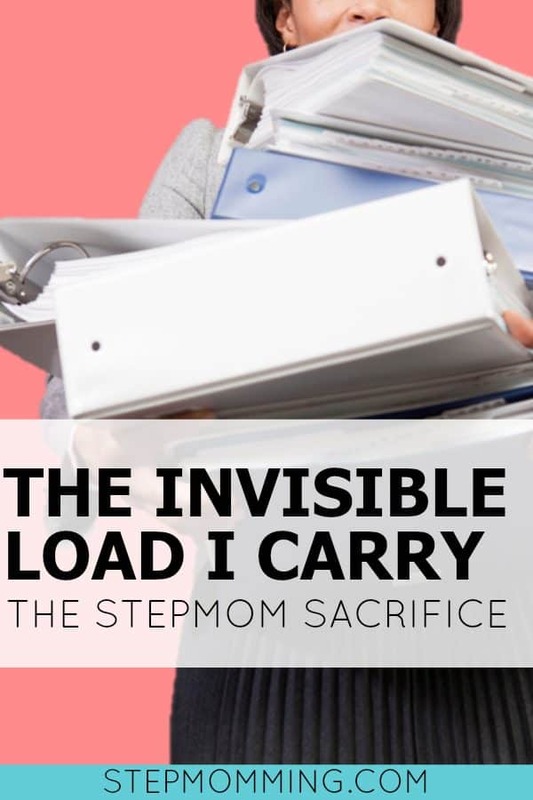 The stepmom sacrifice, if you will. Every single day, I wake up and choose to love a child that can choose not to love me back. Even though every effort is made to love, provide for, and protect my stepdaughter, she can still choose to reject that love. She has inherent loyalty to only two parents, neither of whom is me. When something exciting happens, the open arms she runs to aren’t mine. When she is hurt, my cuddles aren’t at the top of her list. But she tops every single one of my lists. She is the center of my universe (within reason). But that love and devotion isn’t returned with the same strength. If my stepdaughter had to rescue her mom or me from a burning building, I wouldn’t be her choice. And that’s the stepmom sacrifice at its core. It’s choosing someone else even when you know you’re not first choice. It’s also choosing this life every day with the understanding that something could happen to completely sweep the rug out from under you. The shared parenting relationship is a delicate one, and with no notice, you can be thrown into a court battle or other less-escalated argument. The stepmom’s life is interrupted often by her partner’s baggage. Before her marriage, she wasn’t bound to an every-other-weekend schedule. She wasn’t placed in the awkward position of communicating regularly with the woman who had slept with her husband for years. There weren’t strangers rooting against her or watching her every move for a misstep. Do you realize that the stepmom is harassed for what she does or doesn’t do? She needs to be involved or else she’ll be seen as cold and distant – certainly not someone you’d want your children around. But if she’s too involved (a subjective standard), she is seen as overbearing and is told she needs to know her place and stay in her lane. She is expected to do the motherly responsibilities in the house like cook, clean, and help with homework, but don’t even think of referring to her as a mom. When other moms are talking and asking for advice or sharing stories, the stepmom isn’t invited into the conversation. And if she invites herself in, she is met with sideways glances and silence because she’s not a “real” mom. It’s assumed the stepmother will treat all of her children (step or otherwise) equally, or else risk backlash for being partial or unfair to the stepchild. But the stepmom doesn’t have any legal rights to the child. She can’t sign paperwork on the child’s behalf, and if something happened to her husband, the stepmom wouldn’t have any rights to the child. So, until you’ve truly pondered the sacrifice the stepmom has made and the vulnerability she has displayed, don’t assume you know how she feels or what she’s been through. Don’t tell her she knew what she was signing up for. Don’t compare her contribution to a “real” mom. Be kind and thoughtful with your response because the stepmom has endured more than most. PS: Did you know my stepdaughter’s mom lived with me? Can you imagine how that amplified the feelings described? I empathize with you and everything you wrote. It’s just not easy at all and so few people understand. I’ve been the stepmother for four years to my husband’s daughter, now 11, and his son, now 17. We get along well and I like them and they like me, but I realized yesterday that neither of them has ever asked me a single question about me or my family. They know nothing about me and don’t really show any interest. It’s like outside of the context of their father, I am not an individual person. I am just an extension of their dad, a pleasant presence. They have two loving biological parents and so they don’t need an extra parent figure. But it’s painful sometimes to not have children of my own (my first husband never wanted them) and to know that this is “it” for me as a “parent.” No one around me is a childless stepparent. I’m tired of people who aren’t stepparents telling me that (1) I should just be grateful to have a good relationship with my stepchildren, as if it’s not due to all of my hard work, sacrifice, and sensitivity to their needs and (2) having stepchildren is “at least pretty much like having children, right?” No, it’s not. Last year at a party, a woman asked my stepdaughter, “Is this your mom,” referring to me, and my SD replied, “Non, c’est ma belle mère (No, she’s my stepmother)” and the well-meaning but clueless woman then said, “Well a step mother is just like a mother, right?” And my SD said without malice but just matter-of-factly, “Euhh, pas vraiment. (…not really).” It was like a punch in the stomach and it still rings in my ears. And I’m even more of an outsider because I’m American and my husband and his kids are French. I’m doing everything I can to accept that this is how it will be.